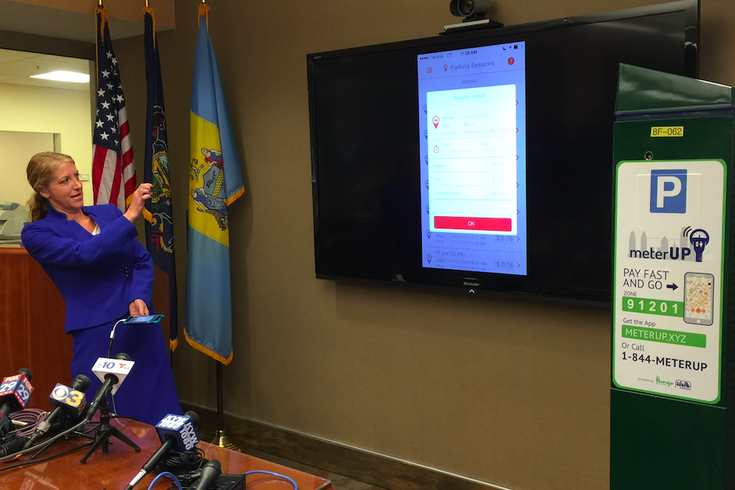 The Philadelphia Parking Authority (PPA) will launch a pilot program for its new “meterUP” pay-by-phone parking app on Thursday, a move forward that likely means more convenience and fewer tickets for drivers. Several pros and cons surfaced during a press briefing at the PPA’s office at Seventh and Market streets (where parking was, in fact, validated for visitors) on Tuesday morning. This being Philadelphia, let’s start with the cons. Fewer tickets could mean fewer dollars heading from the PPA’s coffers into the School District of Philadelphia’s, which, in turn, could bring about higher parking rates down the line. Reporters at the briefing quickly started seeking loopholes or quirks in the system, a line of questioning that led to one discovery. Say your vehicle’s in a two-hour parking zone and you want to extend your time without depending on that old-fashioned move-the-car-to-another-spot fallback. Yes, you can pay via the Pango-powered app. But the hypothetical $3/hour fee jumps to $6 for hours three and four and $9 for hours five and six – but not rising beyond that – because “we don’t want long-term parking, we want short-term parking” in high-traffic areas, Fenerty said. With that, let’s dive into the positives. On Thursday morning, “meterUP” will go into effect in these four pilot-program areas: Fourth to 20th streets between Arch and Locust, Columbus Boulevard between Spring Garden and Race streets, the Torresdale Train Station and the PPA lot at Eighth and Chestnut streets. The first 5,000 people who use the app will receive a free hour of parking. Interested parkers can download the meterUP app for iOS, Android and Windows Mobile via Google and Apple app stores, meterUP.xyz or 1-844-meterUP (1-844-638-3787). Cornell and Pango President Neil Edwards talked and displayed nuts-and-bolts logistics. After an introductory video played – complete with an upbeat infomercial soundtrack – Cornell displayed a process ranging from signing up with your vehicle and credit card information, inputting the parking-location zone (which signage will display once the program launches) and the simplistic nature of pressing buttons to extend time. As opposed to kiosks and meters, the app has a function that lets you note when you’re leaving, thus ending the payment session. There is a 1-cent convenience fee per use, but receipts stored in the Pango account will serve as evidence should drivers receive faulty tickets. If a ticket is being written as someone is paying, the PPA’s system will check before the ticket is complete and negate it if payment is received, Cornell said. Should the pilot program – it covers 267 parking kiosks – be a success, the PPA expects to extend it to 16,000 kiosks and meters citywide. Oh yeah, Cornell said, “no, no, no, absolutely not,” when asked whether vehicle information inserted into the app would then be used to catch people who have unpaid tickets. “There is no interaction between the app and parking tickets,” she said, noting that all payment information goes to Pango, not the PPA. Glitches with the system are expected to arise, so PPA officials asked anybody who has issues with the app to contact them with details.